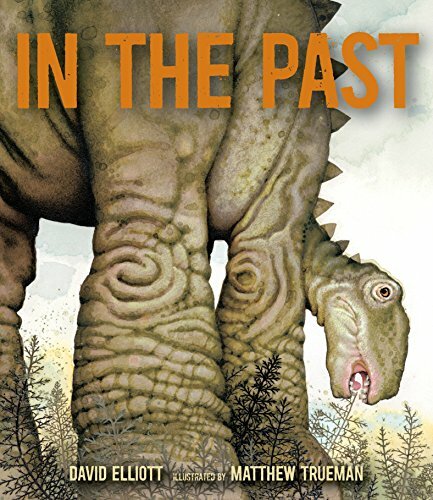 Author David Elliott’s newest picture book, In the Past: From Trilobites to Dinosaurs to Mammoths in More Than 500 Million Years, is a dino-lover’s delight. In this oversized, beautifully illustrated book, Mr. Elliott uses rhyme, free-verse, and even Haiku-ish arrangements, to tell the curious stories of some of the most obscure dinosaurs readers and picture book lovers have ever encountered. The book mentions the Trilobite dinosaur, which looks like a gigantic version of a sea monkey; the pale-aqua Astraspis that resembles a tadpole before it grows its legs and loses its tail; and the Dunkleosteus, which looks like part sea lion and part big-mouth bass (with razor-sharp teeth!). There’s the Meganeura, a sort of like a radioactive dragonfly; the Dilophosauras, which looks like it’s poising a brightly-colored solid-bone cap on its head; and the amazing (and little-known) Yutyrannus, a tyrannosaurus-like fellow that is covered in the most curiously cuddly feathers any reader or budding paleontologist has ever seen. This lovely book features detailed sketches of humongous creatures whose bodies take up full two-page spreads. The book’s emphasis leans more toward the exotic look and feel (as it were) of little–known or more recently discovered dinosaurs rather than the more recognizable of the species. It is definitely not the most detailed dinosaur resource as opposed to some of the more recent dino titles, but it is a solid supplemental resource to add to an already solid library. Artist Matthew Trueman’s illustrations are big, bold, and bursting with color and detail. Use this book as supplemental reading in your elementary science or history class, or as “reward reading” for those children who finish assignments early and have time for their favorite things (like reading! ).